This workshop will teach a holistic philosophy of farm waste stream and material management, as well as on numerous strategies for on farm compost making. Rooted in ecology and whole systems design, Stone Barns implements a diversity of practices to make the highest and best use of any organic material that passes through the property. We will discuss our waste fed pig program, growing mushrooms on waste, and how our various compost systems are used to manage diverse feedstocks for different end uses. We will see a number of these systems in action, and spend classroom time working on the principles of good farm-scale compost production. We will be joined in the last portion of this workshop by Jason Grauer, Senior Crops Production Manager, for a walk through of the dynamic amendment program that is one part of the broad holistic soil fertility management at Stone Barns. Jason will discuss measured approaches to the addition of compost and other organic amendment materials into the soil preparation regiment for short and long term crop health. We will include topics such as seasonal consideration, crop needs, application rates, techniques for incorporation and sourcing material. This portion of the workshop will provide a deeper understanding of how we maintain a low input, high production system. 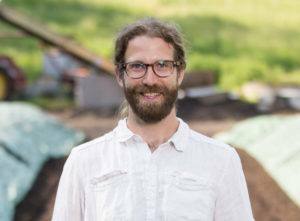 Shane Hardy is senior land manager at Stone Barns Center. He grew up across the river in Nyack, N.Y., and has worked on farms in New York’s Finger Lakes region, Orange County and Rockland County. 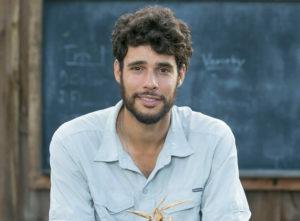 He is thrilled to be working here at home in the southern Hudson Valley and pursuing his passion for building soil, increasing resilience and biodiversity in agriculture and finding creative solutions to meeting our humans needs from the land as healthy partners in the natural system we live in. At Stone Barns Center, Shane works with the organic materials that flow through the center—manure, leaves, food scraps and more—to create compost teeming with life to feed to the soil, while exploring other intermediate and complementary uses for these materials. He provides technical and mechanical support for the rest of the farm team and works on technological and biological innovations for resilient farming. Jason Grauer is the senior crops manager at Stone Barns Center. With a degree in economics from Tufts University, Jason spent the early part of his career in the financial industry. A year spent volunteering at Stone Barns confirmed his desire to farm full time, and he spent two seasons as one of our apprentices. Jason then developed a rooftop greenhouse for Eli Zabar’s Vinegar Factory, worked at Four Season Farm in Maine and assisted with organic seed research in Cornell University’s Plant Breeding and Genetics lab, where he gained a deeper understanding of plant breeding and the seed industry. Jason also co-developed the lab’s first soil-based greenhouse for four-season food production, research and education. Today at Stone Barns Center, Jason manages the daily responsibilities and organization of field crop production, sales of vegetables from the greenhouse, and field and vegetable experimentation and research.